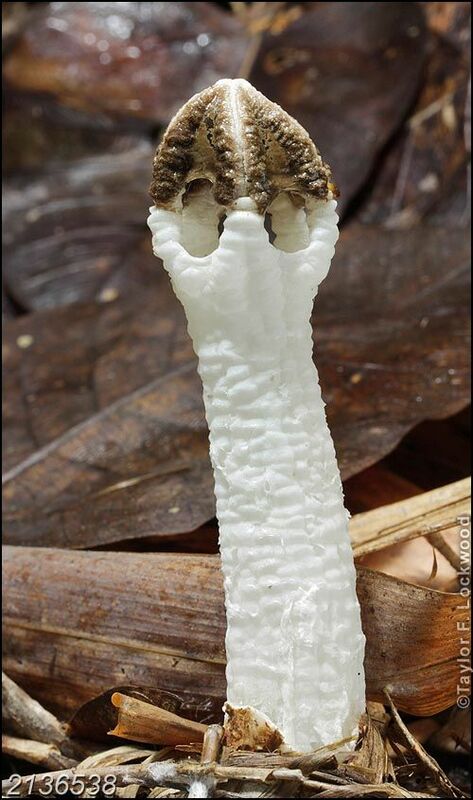 Internationally renowned mushroom photographer Taylor Lockwood photographed this amazing stinkhorn in China in 2013. It appears to match the poorly documented species Lysurus gardneri, which is often confused with Lysurus cruciatus but has whiter, more graceful arms that usually remain united at their tips--and which always have a sterile basal portion that is not covered with spore slime. The spore slime on Lysurus cruciatus extends from the top to the bottom of each arm. Lysurus congolensis is a synonym, according to Dring (1980). Australian authors, including Cunningham (1944/1979), have frequently misapplied the name "Lysurus gardneri" to Lysurus cruciatus. Reports of Lysurus gardneri from the Caribbean also appear to have confused Lysurus gardneri with Lysurus cruciatus. Ecology: Probably saprobic; growing alone or gregariously in a variety of habitats; found in Asia (Sri Lanka, Indonesia, India, and China) and in Africa (South Africa and the Democratic Republic of the Congo); year-round. 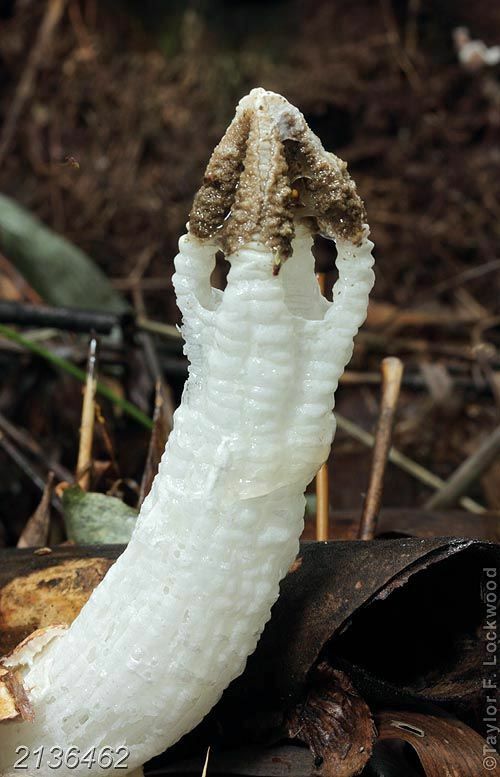 Fruiting Body: At first encased in a whitish "egg" up to 3 cm across; emerging to form a stem and a head. Stem more or less cylindrical; hollow; up to 15 cm long and 2 cm thick; white; lumpy and wrinkled; terminating at the base in a volva. Head composed of 4-6 short arms that are usually united at their tips. Arms white; lumpy; each with a sterile basal portion that is not covered with spore slime; on the upper, inner surfaces finely velvety, markedly lumpy, and covered with dark brown spore slime. Microscopic Features: Spores 4-5 x 1.5 µ; more or less elliptical. REFERENCES: Berkeley, 1846. (Saccardo, 1888; Dring, 1980.) I have not collected this mushroom.